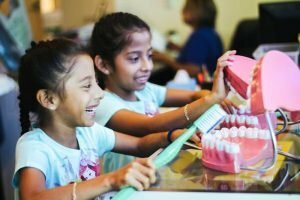 We believe a healthy smile makes a happy child. When you join our #SmileSquad, you are taking a stand against dental disease and helping families access dental care for their children. Through your gift today, a child can get a jump-start on a lifetime of smiles! Will you join our #SmileSquad today? Healthy Smiles is a 501(c)3 non-profit organization; your donation is tax deductible to the full extent allowed by law.